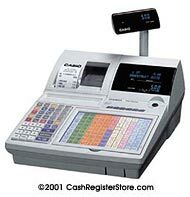 Casio TK-T500 Cash Registers at Cash Register Store.com. The TK-T500 is another of our highly recommended cash registers for high volume restaurants. The TK-T500 features dual thermal receipt and journal printers. Thermal printers are very reliable, print extremely fast while keeping quiet, yet do not require ink cartridge replacements. The TK-T500 comes equiped with 45 raised keys and 108 key reversible spill-resistant flat keyboard. This is an excellent feature for restaurants as the keyboard can be flipped for different menus. Other standard features include 3 RS232 ports for interfacing with scales, printers, scanners and PC communications. The TK-T500 can be equiped with an optional RAC-9 memory card. This card contains your system program which can be transferred to other TK-T500s for quick system program uploads. The TK-T500 comes with a scanning capability under stand alone scanning and it can be expanded to 20,000 items by adding optional memory chips. Essential functions for the scanning environment such as Not Found PLU, PLU batch maintenance file, bottle link and Mix and Match functions are available on the TK-T500 model. The TK-T500 can be programmed and used in Spanish, French and German. Cash register includes cash drawer.